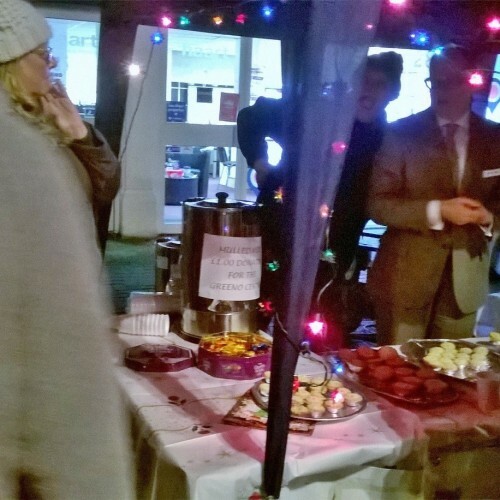 Lodge Brothers Funeral Directors made their presence known at a recent annual Christmas event in Shepperton. ‘Big Tree Night’ is held in mid-December and is regularly attended by thousands of people. Members of the team who work at the branch in Green Lane in the village were joined at the stall this year by Michael Lodge, Company Director. Mr Lodge’s dulcet tones could be heard ‘encouraging’ people to buy their mulled wine and mince pies, in an effort to raise funds for a local charity. This year, District Manager, Richard Leachman had chosen ‘The Greeno Centre’ to be the recipient of all funds raised, and was delighted to count up £300 at the end of the evening. Mr Leachman said, “It was a great effort by all concerned to raise such a substantial sum for such a worthy local cause”.